Recently, the new Prime Minister of Laos has made a series of encouraging statements and actions to tackle rampant forest crimes in the country so it is timely that a report leaked last year, showing the scale of the problem, is now available in the Lao language. Please see below for a link. An unpublished, credible report on logging practices in southern Laos has exposed systematic illegal felling and rampant timber smuggling into neighbouring countries. 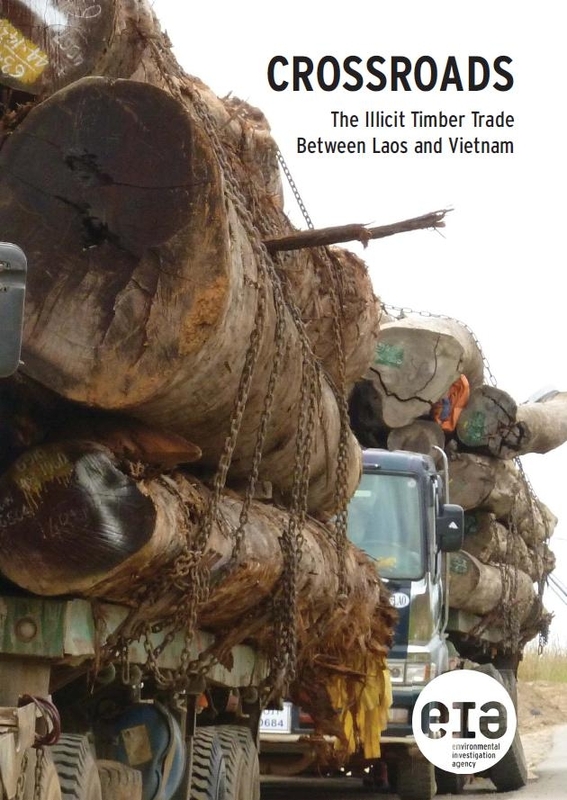 The report’s findings are startling; in 2013, Laos exported 1.4 million cubic metres of timber to Vietnam and China, more than 10 times the country’s official harvest. In some areas the illegal logging rate has reached an astounding 100 per cent. The report, dated June 2015 and entitled Assessment of Scope of Illegal Logging in Laos and Associated Trans-boundary Timber Trade (and available in Lao language here) echoes the findings of a series of field investigations undertaken in the region by the Environmental Investigation Agency (EIA) since 2007. The forests of Laos are being plundered by well-connected companies to feed the wood processing industries of Vietnam and China, and the situation is getting worse. In Laos, virtually all logging operations are linked to forest clearance for infrastructure projects, especially hydropower dams and roads, mining and agricultural plantations. The leaked report finds that such projects are not subject to any meaningful oversight or enforcement; in four southern provinces, over half of the timber exported came from unknown sources. Analysis of logging carried out in Salavan Province for a road construction project found 100 per cent of the timber felled to be illegal. In a mining project in neighbouring Sekong Province, 99 per cent of logging was found to be illegal. It also finds that the Lao Government’s stated policy of banning exports of logs and sawn timber to promote domestic processing has been an abject failure, with opaque “exceptional” permissions ensuring the flow of wood into neighbouring continues unabated. In 2014, logs and sawn timber accounted for 98 per cent of all wood exports from Laos by value. Customs data also reveals routine under-pricing of wood in Laos; in 2013, the recorded value of exported wood was just eight per cent of the value declared in the importing countries. Trade data contained in the report shows that in 2014 China overtook Vietnam to become the biggest recipient of timber from Laos by value, with an increase from $44.7 million in 2008 to a staggering $1 billion in 2014. The high value implies that the bulk of this timber is composed of valuable rosewood species, supposedly protected under Lao law. Together, Vietnam and China receive 96 per cent of wood exports from Laos. Predictably, enforcement in Laos against illegal logging and timber smuggling is found to be virtually non-existent. State enforcement agencies do not conduct inspections of logging operations linked to forest conversion projects. In four southern provinces of Laos, Government agencies confiscated only five per cent of the estimated illegal timber volume and focus solely on small-scale loggers rather than the powerful companies behind the overwhelming majority of illegal logging operations in the country. 100,000 m3 a year in the Xe Kaman 1 dam site. EIA observed large piles of logs with the distinctive yellow COECCO sticker at storage areas near the dam site, as well as in the Vietnamese ports of Quy Nhon and Danang. New information in the leaked report based on remote sensing data shows that 71 per cent of logging carried out in the Xe Kaman 1 dam area between 2007-14 occurred in areas beyond the planned inundation zone, including in nearby protected areas. It appears that COECCO was given a free rein to log wherever it chose, targeting valuable timbers to ship back to Vietnam in contravention of Lao law. When EIA released Crossroads, its findings were attacked by quasi-Government timber trade body called Vietnam Timber and Forest Products Association. 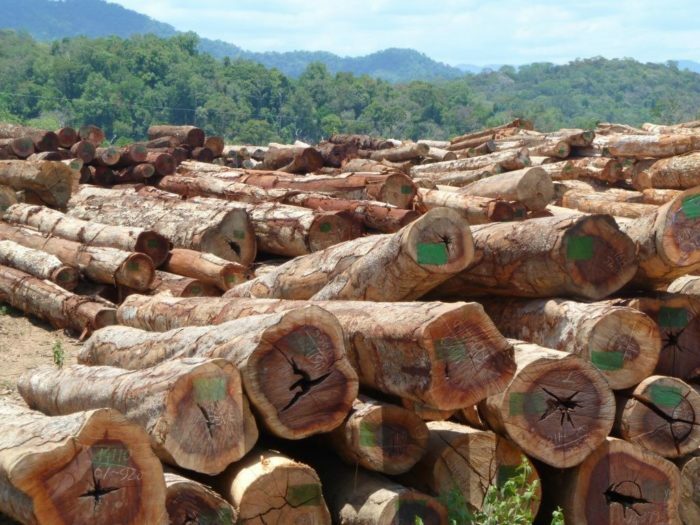 The organisation’s general secretary told reporters that Lao and Vietnamese customs officers “strictly checked timber” and that Vietnamese companies logging in Laos operated in accordance with the country’s law. Evidence contained in the leaked report shows that such statements are clearly fictitious. Commenting on the leaked report’s findings, EIA Senior Forest Campaigner Jago Wadley said: “The prognosis for the forests of Laos is bleak. Industrial-scale illegal logging under the guise of special projects is routine and conducted by untouchable companies, abetted by corruption.